It was a triumph! 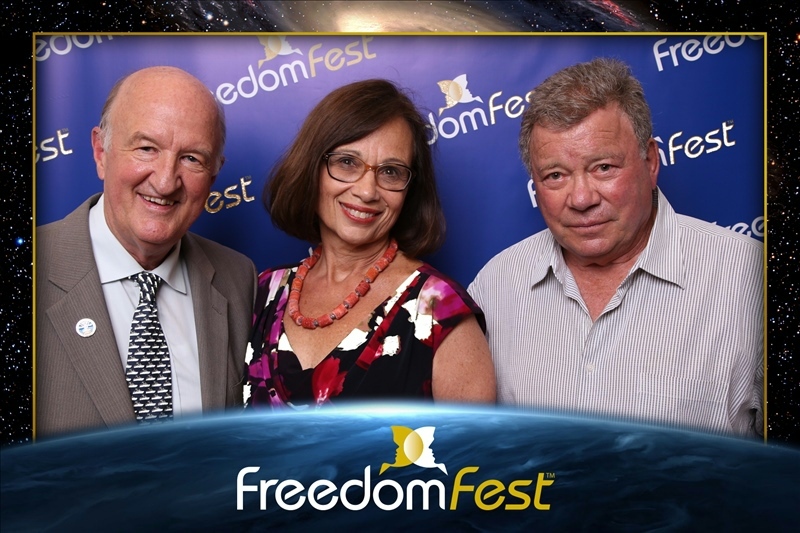 Our 10th anniversary celebration of FreedomFest was a huge success, with over 2,100 subscribers, wealthy investors and concerned citizens joining us at the Paris Resort in Las Vegas. CNN did a major story on us, which you can watch here. Are We Near the Stop in the Stock Market? First of all, we had a great time celebrating Steve Forbes’ 70th birthday… taking the historic photograph of the top libertarians… and interviewing and arm-wrestling William Shatner (!). All in all, we had over 300 speakers, panels and debates, including keynote speakers Greg Gutfeld, John Stossel, Steve Moore, John Fund, Andy Puzder and Kennedy in our mock trial (The Police on Trial). 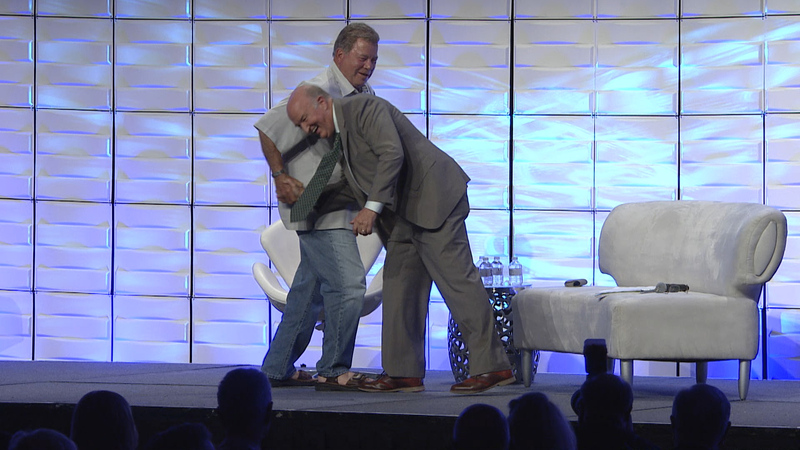 William Shatner, age 86, and Mark Skousen have a wrestling contest. Guess who won? One of the highlights was the panel “100 Years of Forbes,” with Steve Forbes and Bill Baldwin, a long-time editor. Steve shared a personal story about how his grandfather, B.C. Forbes, turned down tens of millions of dollars to sell the publication in 1927 and nearly lost the company three years later in the Great Depression. Rather than succumb to bankruptcy, Forbes’ grandfather enacted pay cuts and helped the company survive, ultimately culminating this year with its 100th anniversary. “Capitalism leads to extraordinary entrepreneurial spirit,” Forbes said. Bill Baldwin also spoke about the 100th anniversary of the magazine by saying, “Forbes outlived the Bolsheviks.” Except in Venezuela! We have our own version of “Shark Tank” at FreedomFest called “Pitch Tank,” run by Angel Investors. Steve Forbes and Kevin Harrington (one of the original Shark Tank judges) were among the judges in the “Pitch Tank” competition, which was won by Revive, an automated external defibrillator (AED) medical device powered by smartphones. At the Saturday night banquet, a wealthy venture capitalist came up, introduced himself to me and said his firm had decided to invest $100 million in various companies participating in the Pitch Tank and that had booths in the exhibit hall at FreedomFest. You never know who you are going to meet at our show. My wife Jo Ann and I wrote a 48-page illustrated pamphlet, “The Story of FreedomFest” — hot off the press and only $5, or free if you order the entire MP3 or CD conference recordings. Call the same number as above to order. Can the Republicans Get their Act Together? We honored Senator Mike Lee at this year’s conference by giving him the annual Leonard E. Read Book Award for his new book, “Written Out of History: The Forgotten Founders Who Fought Big Government.” The book is available here on Amazon.com. The Democrats are known as the evil party, but the Republicans appear set to remain the stupid party if they can’t pass tax and regulatory relief. Steve Forbes, who celebrated his 70th birthday at our conference, said that advocates of a single-payer health care system would take a model that has failed the U.S. Veterans Administration and force it upon all Americans. To really fix the U.S. health care system, he recommended ending the mandate that every employer buy insurance. He also said that the United States should allow nationwide shopping for health insurance, requiring equal tax treatment for all, and forcing every hospital and clinic to post prices for services. Frankly, I’ll be shocked if the Republicans can push through their medical alternative to Obamacare. They have a better chance of cutting taxes. We also had a breakout session with Bill Baldwin, former editor of Forbes on “Beat the IRS: Seven Clever Ways for Investors to End-Run the Tax Collector.” All of the seats were filled and other attendees were standing in the room to listen! We can’t wait for Washington to reduce our taxes and minimize dumb regulations, we have to do it ourselves. There is one bargain left in the marketplace: You can listen to all the sessions at this year’s big show by ordering the CDs or MP3 recordings. Each session is only $5 to download, or only $325 for the entire program on a thumb drive (MP3). If you want the CDs, the cost is $495. Call Harold at Ensign Publishing at 1-866-254-2057, or go to www.miracleofamerica.com. Investment expert Jim Woods shows how you can diversify your portfolio with this banking fund.